1481 Seville: The Inquisition makes its first appearance in Spain. Its target: conversos, Christians of Jewish descent—specifically those who practice Judaism secretly in their homes. The penalty for “crypto-Judaism”: Burning at the stake. Marisol Garcia, a young conversa, is hurriedly wed to Gabriel, a civil lawyer working for the Inquisition, in hopes that he will protect her. But she still yearns for the childhood love who abandoned her four years earlier, and she’s shocked when he reappears suddenly at her wedding. THE INQUISITOR’S WIFE reveals the real motivation behind the Inquisition, a frank glance at a “saintly” queen, and the struggles of a maligned people against crushing forces. 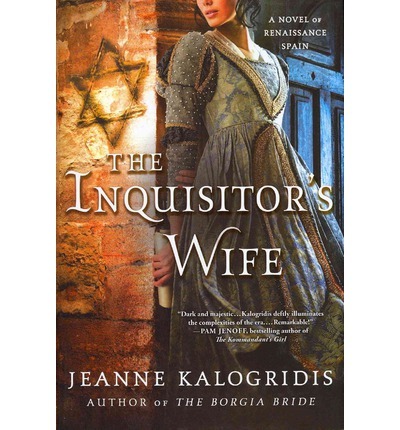 THE INQUISITOR’S WIFE is a novel set in 15th century Seville, a most turbulent era where the Inquisition is actively seeking out and doing away with conversos, Jews who have turned to Christianity to protect themselves, but who clandestinely still practice the Jewish faith. Leaders of the Inquisition have spies everywhere, seeking out anyone who is suspect, permitting neighbors, family, and friends to identify conversos. Marisol Garcia loves her mother who is a conversa. In secret, she has been teaching Marisol the rituals of Judaism. At first, Marisol is young and does not fully understand what she is being taught, but later, as she grows older, she fully comprehends the teachings and vehemently protests, her relationship with her mother in discord. As the Inquisition becomes ever more intense and their interest turns to Marisol and her family, events in her life turn tragic with her mother’s rumored suicide. Despite Marisol’s promise to marry her true love, to protect his daughter, Marisol’s father urgently arranges a marriage to Gabriel Hojeda, a lawyer for the Inquisition. But even being trapped in this unhappy marriage does not keep Marisol safe. Her life becomes even more complicated when her beloved returns. THE INQUISITOR’S WIFE is a wonderfully complex novel with an intricate plot. Numerous plot twists change the characters – no one is who they appear to be at first. If you have never read a novel by Jeanne Kalogridis before, then you are in for a real treat. Her heroines are strong, courageous, and usually face insurmountable dangers and profound dilemmas. The Renaissance was a time of great artistry, but also of great darkness and danger. Kalogridis does not shy away from showing readers the dreadful practices and terror of the time. The story contains some torture and sexuality. And she writes deliciously cruel antagonists, both male and female, who always add much conflict and spice to her stories. There is also a very beautiful love story intertwined! There are always underlying virtues such as trust, honesty, and courage that leave a strong moral message. The prose is beautiful and flowing, easily read and enjoyed. I highly recommend this novel and then further recommend you read one of her other novels. There is much to keep you entertained for hours.